The battle of the sexes leads the Belfast Telegraph, which reveals that only three of Northern Ireland's top 100 companies are led by women. It carried out research into 7,000 top jobs and found that 57% of them are held by men, despite women making up half the working-age population. The exclusive report also says that nearly three quarters of the PSNI's most senior ranks are held by men. The Irish News focuses on a harrowing multiple murder case from 2016. Clodagh Hawe and her three children were killed by her husband, Alan Hawe, in the home the couple shared near Ballyjamesduff, County Cavan. The paper reports that a new documentary will examine unanswered questions about the horrific case and seek "the full truth" about why the father of three murdered his whole family. The programme is called Her Name is Clodagh, in reference to the social media "backlash" over the initial media coverage of the case, which was criticised for focusing on the killer at the expense of his victims, and portraying him as a "pillar of the community". Mrs Hawe's mother and sister have taken part in the programme in a bid to help other victims trapped in abusive relationships. 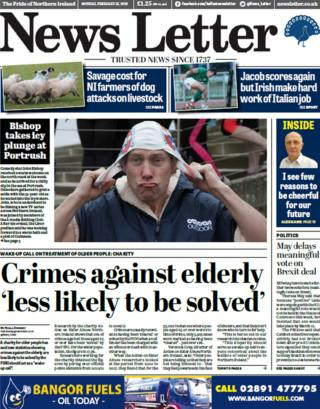 The News Letter leads with new statistics that show a crime in Northern Ireland is less likely to be solved if the victim is elderly. The charity Action on Elder Abuse Northern Ireland has highlighted the fact that only 12% of crimes against people aged 65 and over were solved by police over a seven-year period. The figure for the wider population is 17.5%. The paper says the data was compiled by examining official PSNI crime statistics between the years 2010/11 and 2016/17. The charity's director, Veronica Gray, tells the paper that the disparity "should serve as a wake-up call to anyone concerned about the welfare of older people in Northern Ireland". The News Letter's front page also features a striking photo of the comedian John Bishop as he prepared to take the plunge in Portrush. The Liverpudlian is pictured pulling on a swimming hat and bracing himself for a dip in the icy waters of the north coast, as part of his new TV series filmed across Northern Ireland. The sudden death of a man in Ballymena, County Antrim, is given prominent coverage across the dailies. The man's body was found at a Simon Community hostel in Harryville on Sunday. A 27-year-old man who was arrested on suspicion of assault and robbery has been released on bail. Diabetes has led to more than 900 amputations in Northern Ireland over the past five years, according to the Mirror. It speaks to one amputee, 59-year-old Peter McAuley, who lost part of his foot after ignoring the symptoms of the disease. He said he didn't seek medical help until his leg swelled up to "three times the size it would normally have been". The paper says that three-quarters of amputees are non-insulin dependent, according to Department of Health figures.